These pyramids reminiscent of inverted icicles or Surrealist paintings have already appeared twice here at Río Wang. 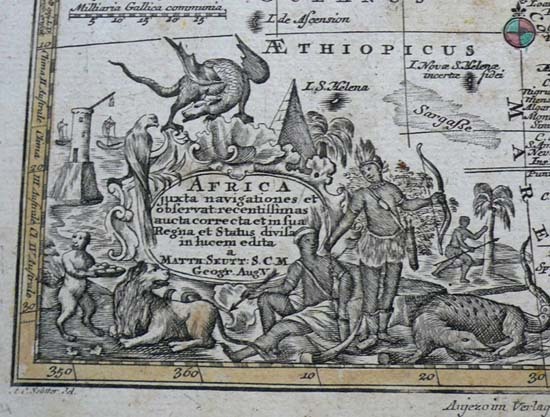 For the first time as the introductory illustration to Wang Wei’s Egyptian journey, cut out from Athanasius Kircher’s Sphynx Mystagoga. And for the second time when we noticed, on the basis of the photos of James Henry Breasted from 1905-1907 that such acute-angled pyramids really existed, although not in Gizeh, where Kircher had imagined them, but more than a thousand miles to the south, over the cataracts of the Nile, in Nubia. But it is now, for the third time that they figure here on their own right, when Ferenc Síkhegyi, research fellow of the Geological Institute of Hungary, having come across the previous two posts, finally presents them not like mere cartographic fancy or vague representation of objects never seen by the artists, but rather as forefathers of a large iconographic genealogy stretching from the shores of the Nile to the shores of the Transylvanian Maros (Mureş), to the 18th-century Reformed College of Nagyenyed (Aiud) and the vicarage of Magyarigen (Ighiu). 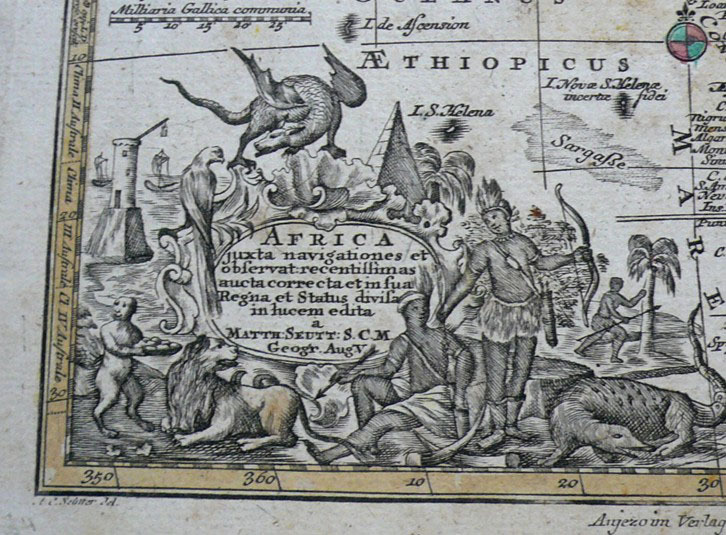 Around the turn of the millennium some maps of the continents with Hungarian inscriptions appeared on the international antique market. 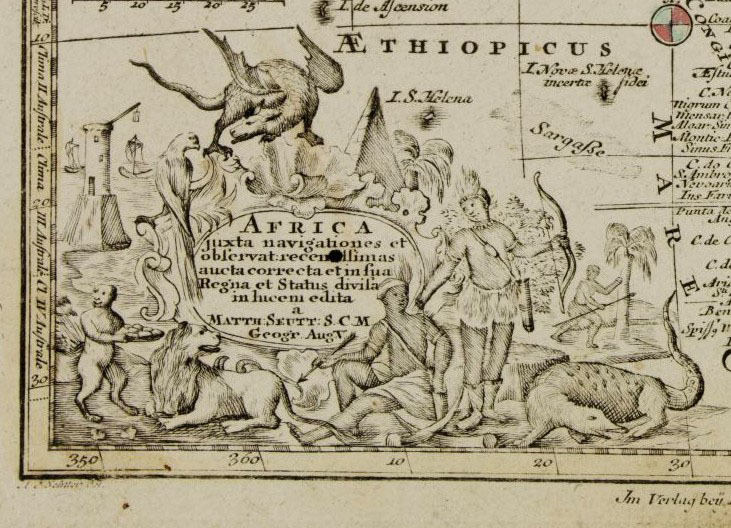 It was obvious at the first glance that they are perhaps the earliest cartographic representation of the Hungarian geographical names of these far away lands. 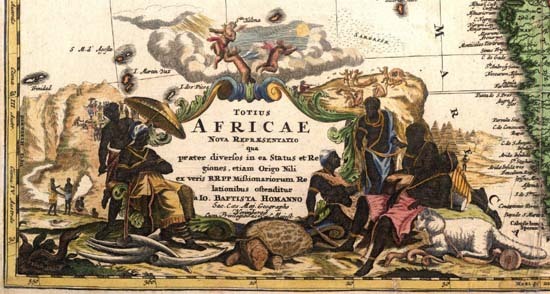 Their drawings, reflecting the geographical knowledge of a several decades earlier period, their simple, almost childlike design, their style and the almost smile-provoking attempt of Hungarization of the international geographical nomenclature all point to the middle of the 18th century as their probable origin. 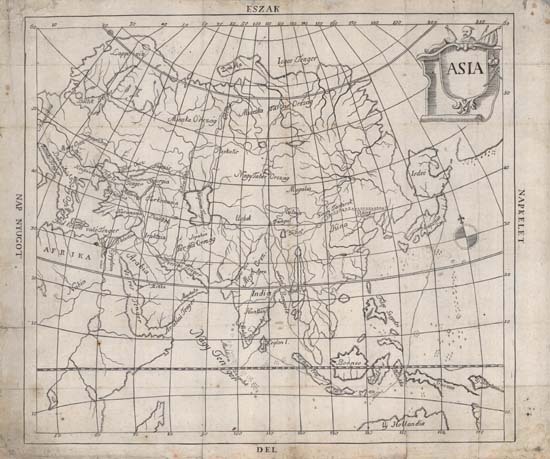 They were foldouts, as it is attested by the visible traces of folding as well as by the lack of the high-flown Baroque colophons, typical of the single map sheets. 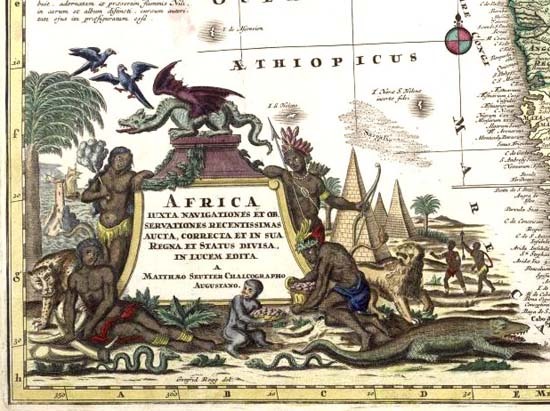 The title cartouches are very simple, only that of Africa includes clear references to the continent represented. Even on the basis of the first impression it was obvious that these maps were the products of the then emerging Hungarian-language Protestant book publishing. 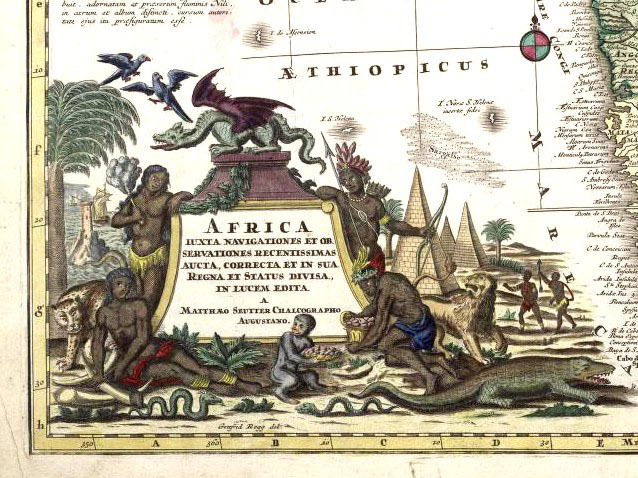 The pointy pyramids, cat-like beast, the snake trotting across the desert and the image of the savage man decorated with feathers do not exclude that the designer compiled only after hearsay the supposedly African motifs, including the pyramids of Gizeh borrowed from the seven ancient marvels. Well, this was the best he could accomplish. 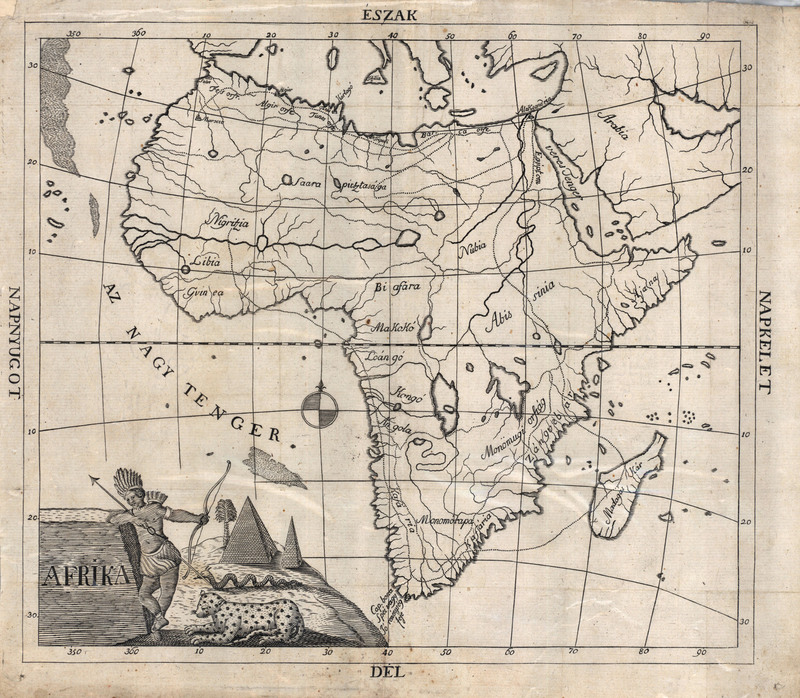 The definitive identification of the maps is the merit of the Oxford cartographic historian László Gróf who was led by a lucky computer filtering to the work of the Transylvanian Calvinist pastor Péter Bod preserved in the local library: “Az Isten vitézkedő anyaszentegyháza állapotjának, és világ kezdetéül fogva a jelen időig sokféle változásinak rövid historiája, melly az Isten magyar népének hasznára egyben szedegetetett, és a dolgok nagyobb meg megvilágíttatásáért, a’ világ négy fő mappáival ki adattatott” [A brief history of the conditions of the fighting church of God from the beginning of the world and through its several changes to the present time, compiled and for the greater clearness of the things provided with the four main maps of the world] (1709). 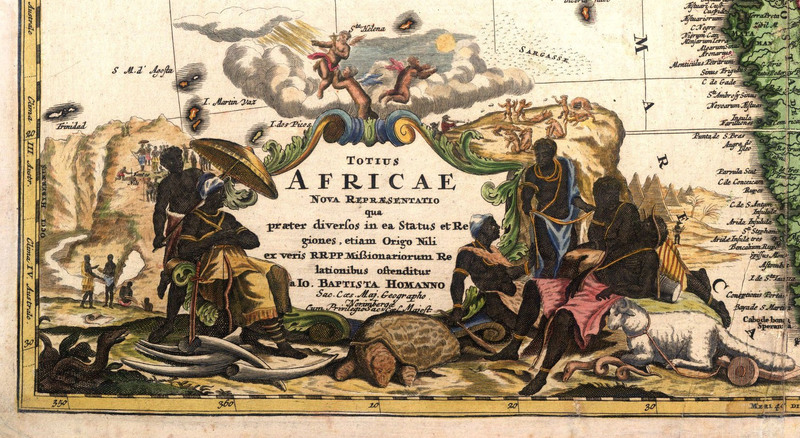 The points marked on the maps helped the reader to follow up the description of the book. 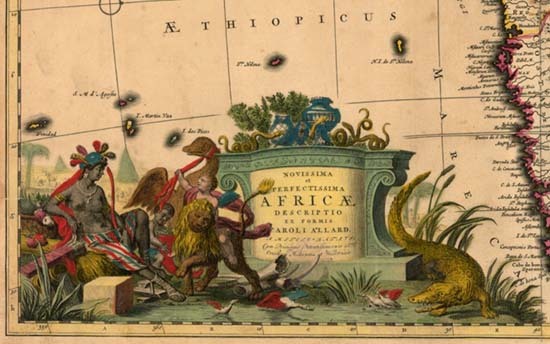 The book and the maps have an invaluable linguistic significance, as they belong to the earliest attempts of the development of a scientific nomenclature in the Hungarian language. 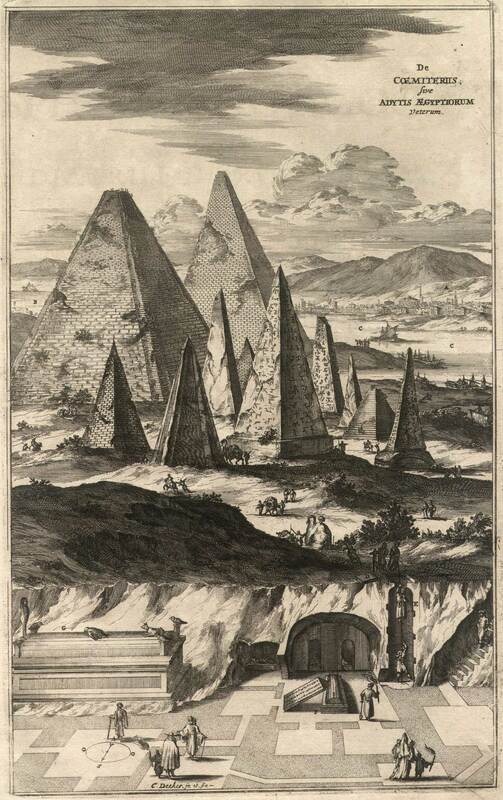 At this point the examination of the maps was divided into two directions, and this is where the story is connected with the Nubian pyramids. 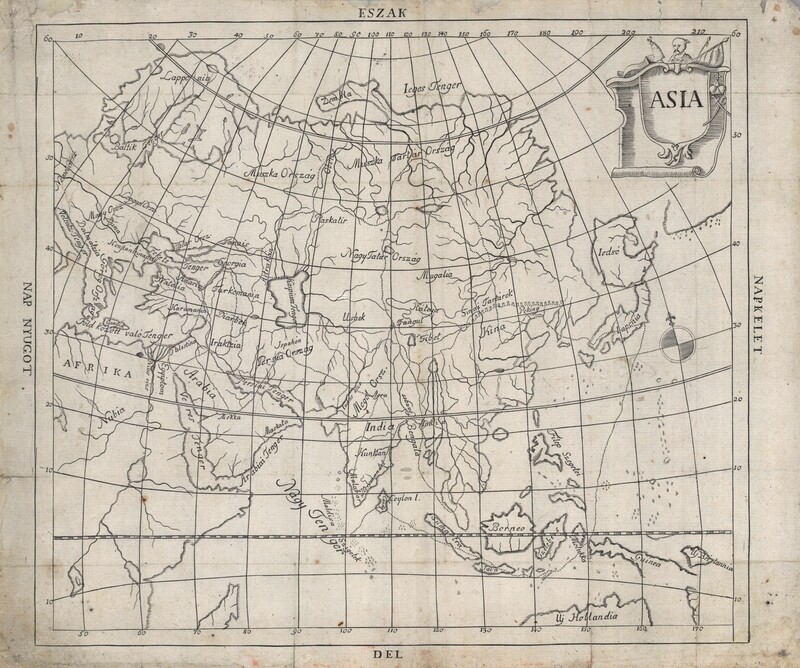 László Gróf has also revealed that the maps were copies of some pages of the Atlas Novus published in the second quarter of the 18th century by M. Seutter. 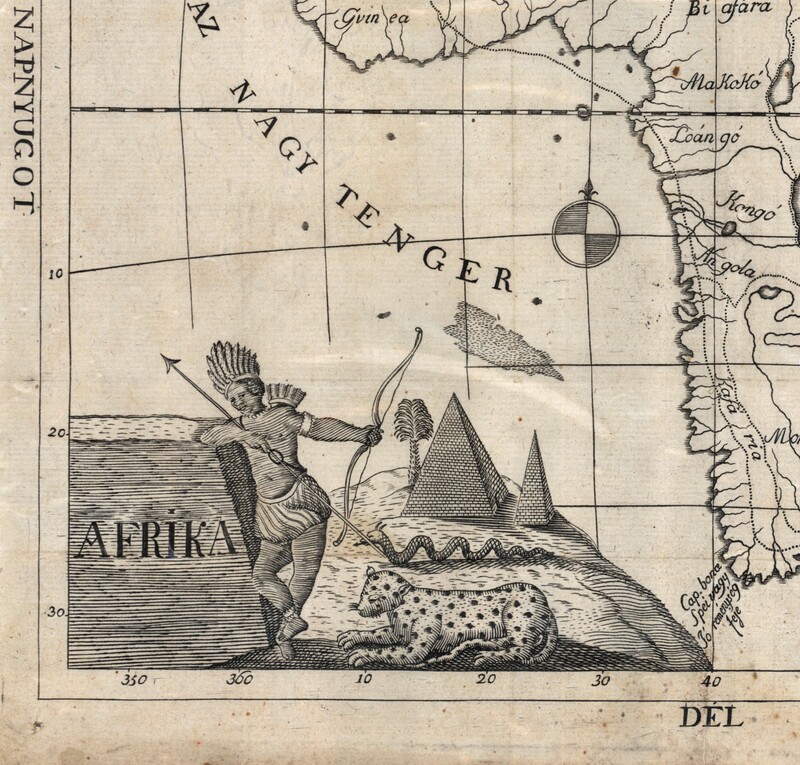 The title cartouches of the original are nicely elaborated, and the pyramids of Africa clearly evoke the illustrations of A. Kircher. 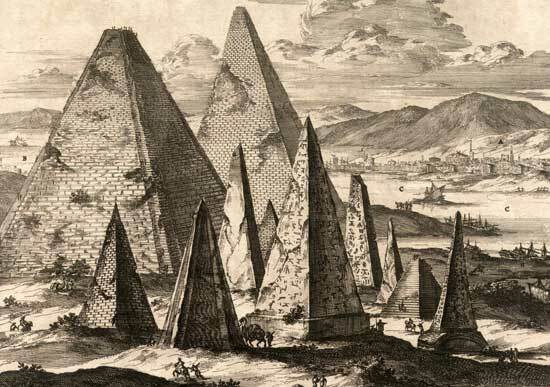 As the book of Kircher was extremely popular since its publication, and only a few decades had passed since then, we can assume that the strange unit of pyramids were borrowed from there by Seutter. However, the line of origins is not yet complete. 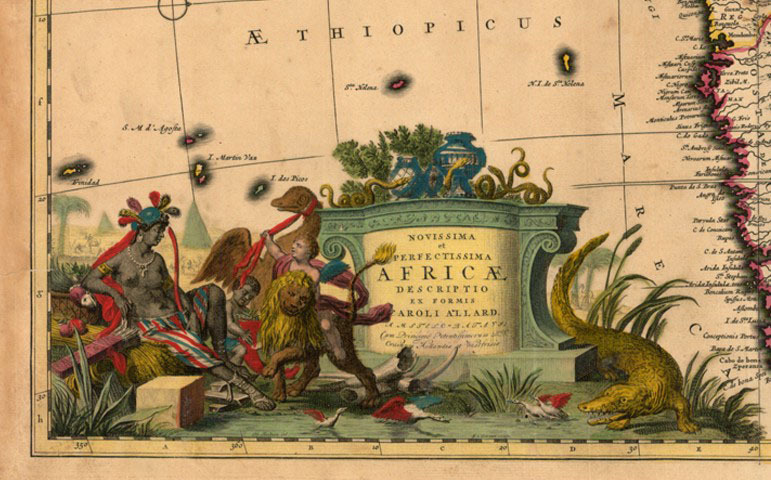 We still have a small chance to find an illustration which served as a model for Kircher. 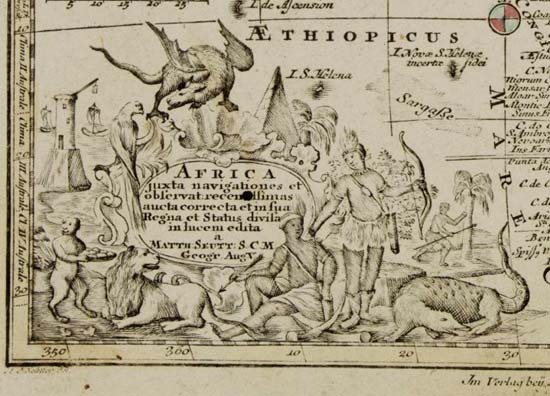 Nevertheless, this book of his was extremely well-known, popular and influential for the intellectual life of the period, including map-makers. 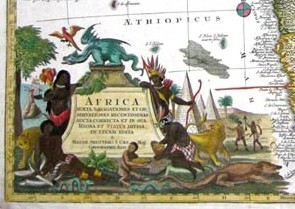 In this age the publishers of maps and books did not consider as a matter of conscience the copyright infringement in the modern sense. They played the game “Who copied whom and what” with a great liberty. Nowadays the unraveling of these threads is similar to the tree of descendence of Homo sapiens. This tree is full of thin-away branches, dotted lines and question marks. Their detection is often supported by good chance, as it happened now through browsing the internet which finally lead us to the shores of Río Wang. ¡Muchas gracias también en el nombre del autor!